Unilever PLC (UL) provides fast-moving consumer goods in Asia, Africa, Europe, and the Americas. This international dividend achiever has paid uninterrupted dividends on its common stock since 1937 and increased payments to common shareholders every year since 1999. The most recent dividend increase was in June 2011, when the Board of Directors approved an 8.20 % increase in the quarterly dividend to 22.50 euro cents/share. Unilever’s largest competitors include Procter & Gamble (PG), Kraft (KFT) and Nestle (NSRGY). The company has managed to deliver a 15.50% annual increase in EPS since 2001. 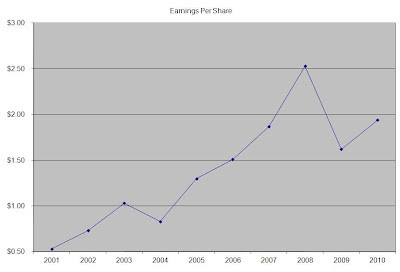 Analysts expect Unilever to earn $2.20 per share in 2011 and $2.40 per share in 2012. In comparison Unilever earned $1.94 /share in 2010. 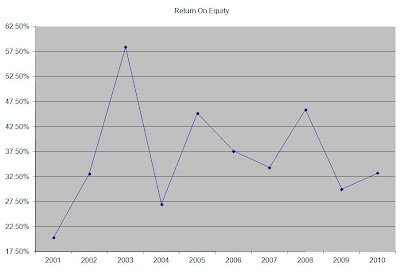 The company’s Return on Equty has followed an upward trend from 20.30% in 2001 to 33.20% in 2010. Overall, despite volatility, this indicator has remained at high levels over the past decade. Rather than focus on absolute values for this indicator, I generally want to see at least a stable return on equity over time. The annual dividend payment has increased by 11.20% per year since 2001, which is in line with the growth in EPS. With international dividend achievers, it is important to look at the trend in distributions in their base currencies. Despite the fact that the annual dividend payment appears volatile in US dollars, the growth in distributions in UK pounds has shown a consistent upward trend in distributions. 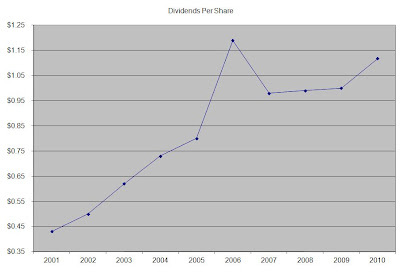 An 11% growth in distributions translates into the dividend payment doubling almost every six and a half years. If we look at historical data, going as far back as 1988 we see that Unilever has actually managed to double its dividend almost every seven and a half years on average. 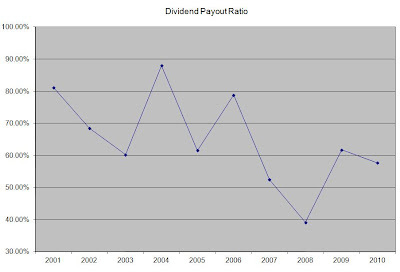 The dividend payout ratio has been on the decline over the past decade. It fell from a high of 80% in 2001 to 57.60% in 2010. A lower payout is always a plus, since it leaves room for consistent dividend growth minimizing the impact of short-term fluctuations in earnings. Unilever is a company that is headquartered in the UK and the Netherlands. In this analysis I am concentrating on the British based, American Depositary Receipts. Unilever operates as a single business entity. However, there are two owners: Unilever (NV) and Unilever (PLC) which are the two parent companies of the Unilever Group, having separate legal identities and separate stock exchange listings for their shares. You can find Unilever shares trading on NYSE as (UN) or (UL) representing NV and PLC respectively. By investing in the UK shares, I am avoiding foreign withholding of my dividends. Currently Unilever is attractively valued at 15.90 times earnings, has a sustainable dividend payout and yields 3.60%. I would consider adding to my position in the stock on dips.